To tie these Carrick Bend knots so they fit snugly around each box, you will tie a decorative knot in the center of a pair of ropes, and then wrap it around the box, taping the loose ends in place on the underside. A knot that ties two pieces of rope together is called a bend. Start with two 12-inch pieces of rope for each box. 1a. 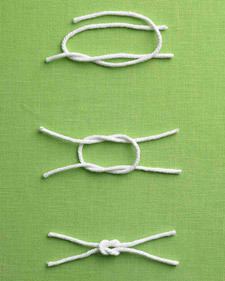 To tie this knot, first make a loop in the center of the left-hand rope; cross the loose ends so the bottom strand lies on the top strand, as shown. Leave this loop lying still (it will become the "standing part"), and wind the other rope around it as directed. 1b. Position the right-hand rope as shown: Lay it over the top "tail" of the standing part, and pass it under the bottom tail. It should make a loop in the center of the rope. 2a. Slide the top "tail" of the right-hand rope under the loop of the standing part, so that it peeks through, as shown. 2b. Bring the bottom tail up over the bottom of the loop, and pass it down through the loop . . .
3. . . . and under the top tail of the right-hand rope, then up out of the loop and over the top of the loop. 4. Grasp the two sets of tails (one set in each hand), and pull firmly and evenly to tighten the knot. 5. Wrap knotted ropes around box, with the knot centered on top. Secure loose ends of ropes to the underside of the box with tape; trim away excess, and cover loose ends with a sticker (we cut a square of the same paper, and ran it through a Xyron sticker machine). To tie these figure eight knots so they fit snugly around each box, you will tie a decorative knot in the center of a pair of ropes, and then wrap it around the box, taping the loose ends in place on the underside. To make this knot match the others in weight and appearance, we used a double rope; start with two 12-inch pieces of rope for each box. 1. Make a loop in the center of the doubled rope, passing the right-hand tails up and over the left-hand tails over the left-hand ones, as shown. 2. Pass the right-hand (or top) tails of the rope under the left-hand tails. 3. Pass the right-hand tails through the center of the loop from the top. 5. Wrap knotted ropes around box, w/ knot centered on top. Secure loose ends of ropes to the underside of the box with tape; trim away excess, and cover loose ends with a sticker (we cut a square of the same paper, and ran it through a Xyron sticker machine). 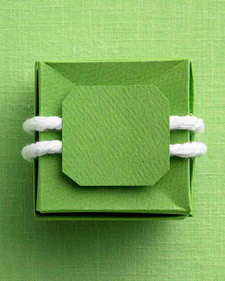 To tie these square knots so they fit snugly around each box, you will tie a decorative knot in the center of a pair of ropes, and then wrap it around the box, taping the loose ends in place on the underside. 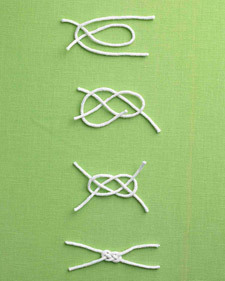 The basic formula for the square knot -- one of the most basic of knots (and the base knot you use when tying your shoelaces) is "right over left, left over right." 1. 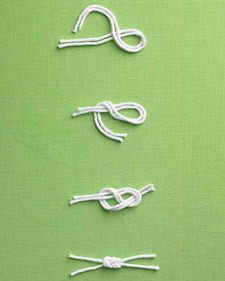 To get your square knot bang in the center, fold the right-hand rope into a loop in the center. Pass one end of the left-hand knot over and under the bottom of that loop, and curve the rope back to the left, passing it over the top of the loop . . .
2. . . . then pass it under the loop and back out. 3. Grasp the two sets of tails (one set in each hand), and pull firmly and evenly to tighten the knot. 4. Wrap knotted ropes around box, with knot centered on top. Secure loose ends of ropes to the underside of the box with tape; trim away excess, and cover loose ends with a sticker (we cut a square of the same paper, and ran it through a Xyron sticker machine).